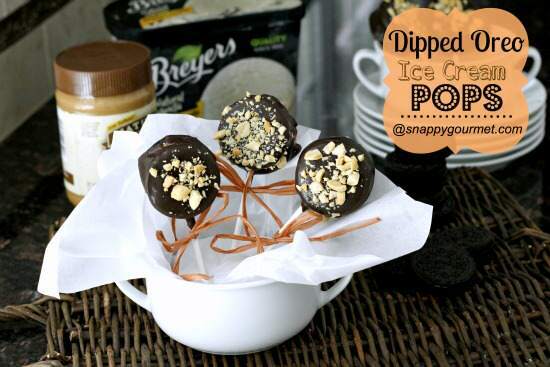 Dipped Oreo Ice Cream Pops, an easy dessert or snack recipe with Oreos, ice cream, peanut butter, and chocolate. 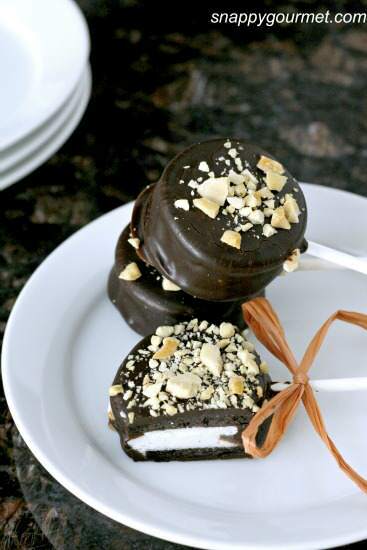 Dipped Oreo Ice Cream Pops, an easy homemade dessert recipe perfect for summer! 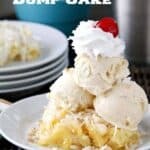 With the 3-day weekend coming up here, I thought a fun easy dessert was in order before summer is over! 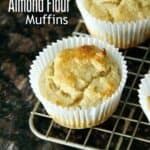 Only 6 ingredients and not long to prep! You can also easily change these Dipped Oreo Ice Cream Pops up a bit with different flavors or colors for any event or occasion!! 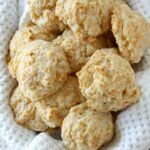 They do need to freeze for a little while before serving but they’re great to make ahead of time for parties! I will definitely be making these Pops regularly!!! 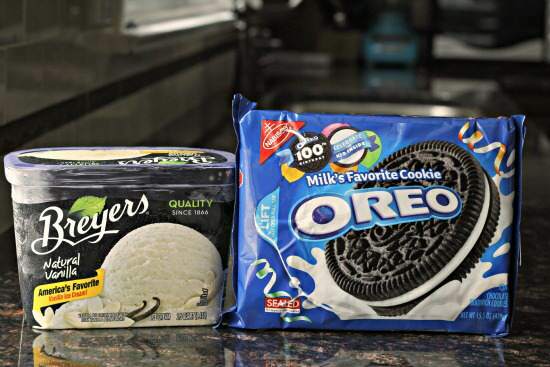 First thing you need to do is get yourself some Oreos and ice cream. I used regular Oreos and Breyers Natural Vanilla. Any flavor of Oreos and ice cream would work well! Get yourself some popsicle or lollipop sticks. 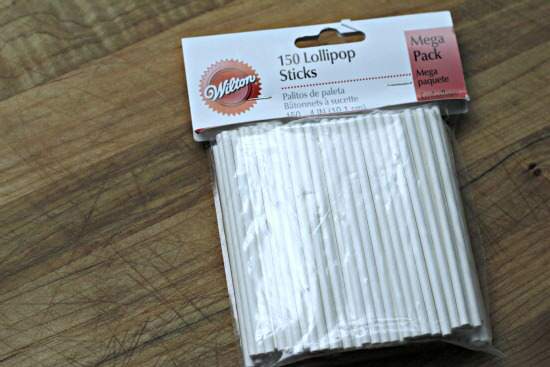 I used Wilton’s Lollipop Sticks. They come in handy every now and then (and the kids love to use some for craft projects!) so I always seem to have a big supply! Let your ice cream soften a bit. While the ice cream is softening at room temperature for a few minutes, split your Oreos in half being careful not to break them. Place about 1 1/2 tablespoons of ice cream (or as much as you’d like) on one side of half the cookies, then top with the other half of the cookie. I used a small ice cream scoop which worked great. Press together gently (don’t press too hard or they’ll break) so that the ice cream is an even layer and toward the edge of the cookie. Place a stick in each stuffed cookie then place on a sheet pan that has been lined with wax paper. Freeze for about an hour or so or until the ice cream is hard. Leave your Pops in the freezer while you prepare the “dip”. You could make an actual ganache with chocolate and cream but I didn’t have any heavy cream on hand so I just used what I had around and everything turned out great. 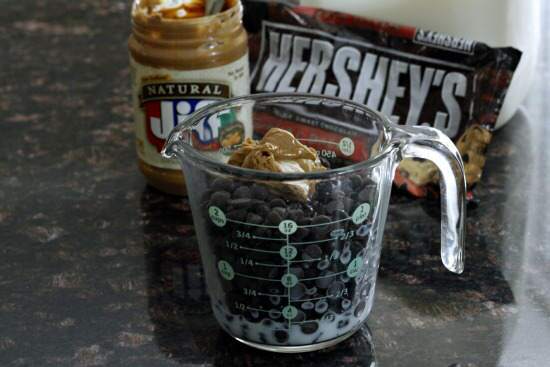 Place the chocolate, peanut butter, and milk into a microwave safe container. Something narrow works better for dipping so I placed everything in my glass measuring cup. Microwave on high for 30 second intervals. 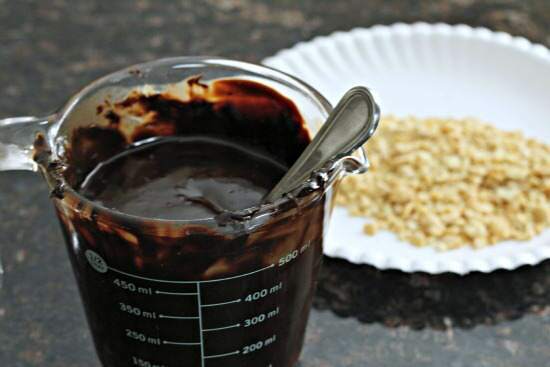 Stir after each interval until the chocolate has melted about 2 minutes. I used Jif Natural Peanut Butter and Hershey’s Dark Chocolate Chips. Add a little more milk as needed until the dip is thin enough to use for dipping. Take a few pops out of the freezer at a time (you want to make sure the ice cream stays cold or it will melt). Dip one pop at a time then place on another plate or baking sheet lined with waxed paper. 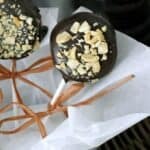 Sprinkle a few chopped nuts on top then freeze the pops for another hour or so until the chocolate has set and ice cream is hard. Repeat until done. Work quickly to keep the ice cream cold! I forgot to take a few more pictures if this part, sorry! 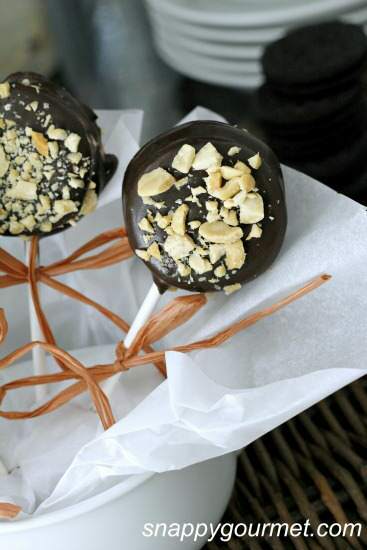 Don’t worry if when you put your pops on the wax paper some of the chocolate drips down and looks messy. When you pull the pops out of the freezer you can use a knife and clean up the edges if you’d like. I had a few pops that got a little gloppy (mostly my fault because I got carried away and put a lot of chocolate on them!). There you go! Your Dipped Oreo Ice Cream Pops are ready to go! 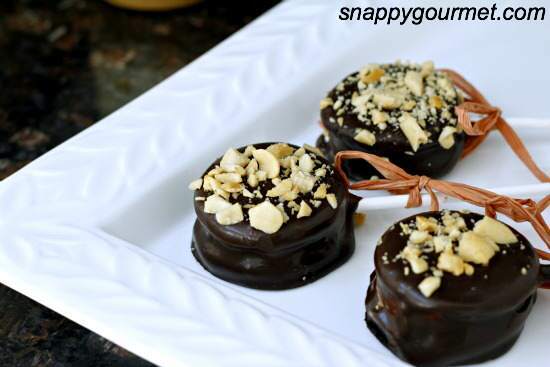 If you have some chocolate leftover, make a few more pops or cover and refrigerate the dip. 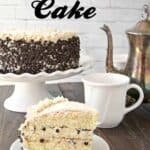 Reheat and serve over ice cream, pound cake, or dip some fruit in it! I tied a some ribbon around the sticks. Great way to add a little color or personalize the Pops for your party! Can’t wait to try these with different flavor combinations!!! I already have a lot of varieties I want to try!!! 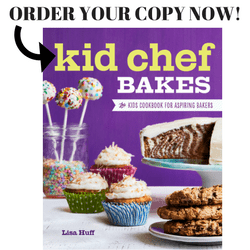 A great treat that can easily be personalized for your family or party! Place cookies on work surface and separate each cookie in half. Spoon about 1 1/2 tablespoons of ice cream onto half of the cookie halves. Top with other half of cookie and press gently to spread the ice cream to edges. Place a stick in the ice cream of each cookie. Make sure the stick is at least halfway up the cookie so that it's stable. Quickly place the pops on a wax paper lined baking sheet or dish and freeze for about an hour or until ice cream is hard. Keep pops in freezer while preparing the dip. Place chocolate chips, peanut butter, and 3 tablespoons milk in a microwave safe bowl or container. A taller narrow container works best for dipping. Microwave on high for 30 second intervals, stirring after each interval, until smooth; about 2 minutes. Add more milk as needed until dip is thin enough to coat the pops. Cool slightly. Line another baking dish or plate with wax paper. Remove several pops, dip in chocolate, then place on baking dish or plate. 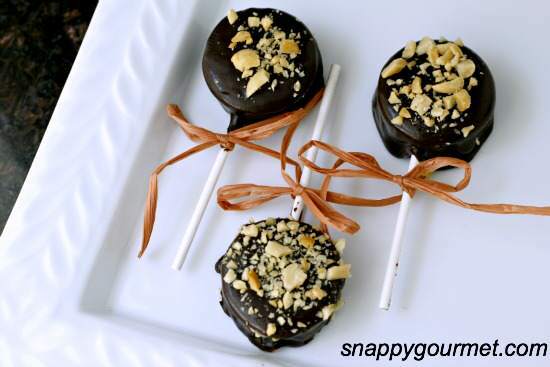 Sprinkle peanuts on top then place in freezer and repeat until all pops are done. Freeze for about an hour or until chocolate is set. If some of your edges aren't neat, use a sharp knife to smooth edges. SNAPPY TIPS: Keep the ice cream and pops in the freezer as much as possible while preparing to keep them cold and easier to manage. You may have some chocolate dip left. Store in the fridge and reheat to serve over ice cream or use as a dip for fruit. You could also make additional pops if desired. 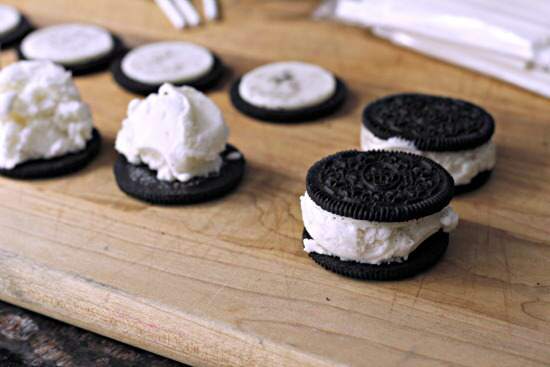 SNAPPY SUBSTITUTIONS: You can substitute different flavors of Oreos or ice cream. 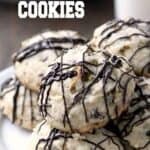 You could also use semi-sweet or bittersweet chocolate chips. So clever Lisa!! These are adorable and perfect for summer parties!! Wonderful idea!! These are great! I actually have a giant bag of oreos that I intended to use to make regular chocolate dipped oreos for my husband as a surprise and then I got super busy with school and never did it. 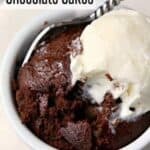 Definitely making them this weekend, my husband will flip! Thanks! Hope they turned out well for you!